1. all behaviors are in response or reaction to something. it is my job to try and figure that out. it is my job to honor that fear or pain. it is my job to care for the underlying issue. they aren’t just trying to “push my buttons” or “make me mad” or “be naughty” or “test my patience.” they are simply responding or reacting to something and i may never know what it is. that shouldn’t stop me from assuming they are hurting or scared. 2. my day should not be determined by how the children behave, but by how i respond to them. 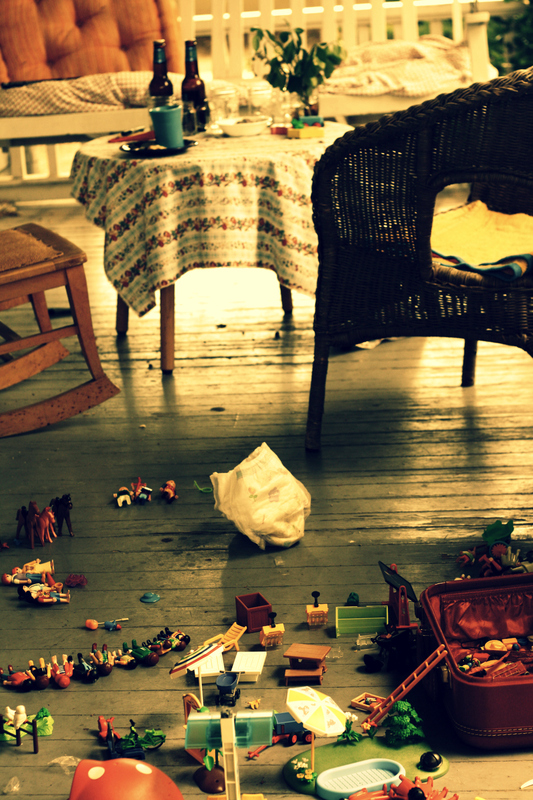 if no one comes to circle time easily, if there is block throwing and hair pulling, if there is yelling and running away from me, if the project flops and no one wants it, if children say they are bored, if they are scared and homesick and crying….how i respond to each of those things is what matters. it is not a child’s job to “give me an easy day.” it isn’t my job to take a martyr position when it’s been rough. there have been many days when in processing with my classroom assistants i’ve said, “well, it might not be better next time, but it will at least be different.” as soon as things are going in an undesirable way, with squinted eyes and determination, i am scheming a plan for next time. 3. every single move i make and every utterance from my mouth counts. if my eyebrows are furrowed, if my back is turned, if i suggest conditional love, if i delay assistance, if i answer the phone, if i hurry someone…even the things that don’t seem like a big deal….if a child’s spirit isn’t bolstered by my actions, i don’t want to do them. how i look at them when they arrive, when i choose to avoid eye contact because they seem to feel vulnerable, when i dance around the topic to get a read on how they’re feeling…it all counts. 4. it is my job to bend over backwards for them. one day there was a child known to hit and yell at others if they even came within 2 feet of her. she was at the play-dough table working constructively and choosing to be alone. i see another child approaching the table. i could have said, “remember _____, you have to share the play-dough and tools with him” or “_______, if you want to stay at the play dough table, no hitting or yelling” or “remember to be nice.” none of those things are wrong to say, but i’m guessing this could have set her up, maybe thinking i already called her out for not sharing or being nice. maybe choosing to then really giving me something to watch. maybe thinking she was already in trouble, so what’s the point. it might also suggest to the approaching child that i am not confident in his safety. so instead i say, “hey _________, _________ is coming over to the play-dough table so can you show him which tools and play-dough he should use?” smiles, power and constructive interactions prevailed. i don’t see this as “coddling” or “enabling.” i see this as setting them both up to succeed. i see this as her knowing i believe in her ability to be helpful in the classroom. in that moment i don’t remind her of past offenses. but i remember them and work like crazy to avoid another one. her slate is clean, it is mine that is full of the memories of what has happened. it’s my job to try to change the next interaction. with my heart tightening and brain buzzing a bit, i remember hearing adults who were judgmental, critical, guilt pushing and power hungry. with a deep breath and warm belly, i remember hearing the adults who were, plain and simple: nice. i want to just be nice to kids. assume the best in them, assume their “misbehavior” is out of fear or pain, assume that i can make a difference, assume that i’ll never be thanked, assume i’ll never see the fruits of my labor, keep my eyebrows raised, hold them accountable, set the stage, remind them of rules, stay in charge, jump a step ahead of them when i have to and just be nice. Amen and Amen! Thank you for your insightful post – I am going to share it with our new preschool teachers, and keep it in my own “old” teacher’s heart as I go forward this year. I have my own little “known to hit” child this year, who needs love and kindness and someone who believes in him. yes! all behavior IS communication. it is the job of adults to listen. Beautiful, inspirational. I have read and re-read it. Thank you. I love the reminder that all behavior caused by something, and my day should be determined how I respond to them. How true. I needed to hear that in these “are these new preschoolers every going to figure school out” days. Thanks. I agree with most of your points. 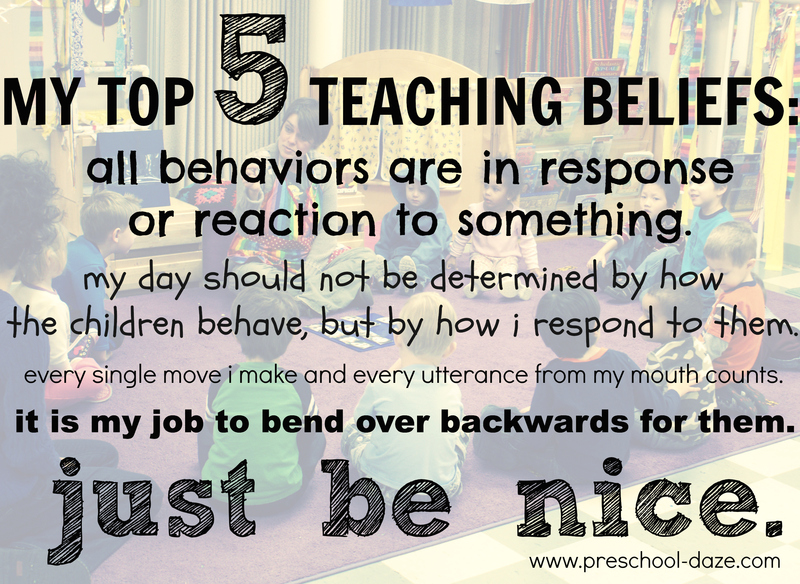 As much as I love my job as an ECE, it’s not my job to bend over backwards for them. If I were to bend over backwards for 16 preschoolers on a daily basis, I wouldn’t be sane. My job is to facilitate play and point out the positive interactions instead of calling out the bad ones. I do agree that it’s better to believe they have a clean slate, and to hide that maybe in the past, they did x wrong. Each experience is a new one. Oh, how I wish this came easy for me. Great post! I feel as you do. Much of this holds true with our own interactions with adults as well. (1. 2. and 5). Thanks for sharing. Thank you for another beautiful post about the great responsibility we have as teachers of young children. I teach college students who are on their way to becoming teachers and this type of information is more important than any “lesson plan” will ever be.